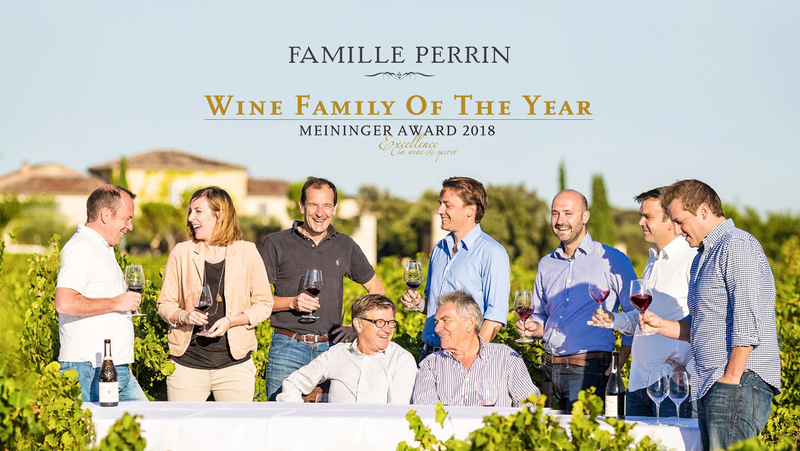 Famille Perrin has been named ‘Winery of the Year’ at the 14th Meininger Awards – Excellence in Wine & Spirit, organised annually by German publisher Meininger Verlag during the ProWein International Trade Fair in Düsseldorf. From the iconic “Hommage à Jacques Perrin” and the legendary "Château de Beaucastel" to the partnership with Brad Pitt and Angelina Jolie at Miraval, Famille Perrin has experienced more than a century of success. From North to South, the grape varieties of the Rhône Valley hold no secrets for Famille Perrin. Individually, they reproduce the singularity of each terroir, as is the case with the Syrah from the Côte Rôtie to the Cornas, via the Crozes Hermitage of Domaine Les Alexandrins. Together they blossom in the Château de Beaucastel in which the 13 traditional varieties are blended and reveal the complexity of each plot in the various appellations of the South. With this award, the world of wine commends both a pioneer and visionary family: a pioneer in organic farming since 1953 and in biodynamic winegrowing since 1970, the first to have used the Rhone varietals in the U.S. and to believe in the potential of Paso Robles from 1989. If the worldwide success of “La Vieille Ferme” has contributed, since 1970, to the recognition of the quality of the Rhone Valley wines in more than 80 countries and to the development of the wine estate, the company has remained a family business. Famille Perrin consists of two generations, nine brothers, sisters and cousins who share the tasks and decisions under a philosophy of excellence initiated by Jacques Perrin. The legendary cuvée “Hommage à Jacques Perrin”, a tribute to him, is the only non Bordeaux French wine to be distributed by Bordeaux negociants alongside the Premiers Crus Classés. Associated with the world’s finest wine producing families, Famille Perrin is a member of the Primum Familiae Vini association since 2006.